It's been a rocky road for the FCC's Broadband Deployment Advisory Committee (BDAC). Created by Federal Communications Commission (FCC) Chairman Ajit Pai to accelerate broadband deployment throughout the US, the BDAC is suffering its latest setback with news that the former committee chair Elizabeth Pierce has been arrested on charges of wire fraud and could face up to 20 years in prison. Pierce was tapped by Pai to lead the BDAC a year ago, but abruptly resigned from the position late last summer. The Wall Street Journal now reports that Pierce allegedly defrauded investors to the tune of $250 million. In her role as CEO of Alaska-based telecom company Quintillion, Pierce is accused of forging contracts that promised roughly $1 billion in revenue in order to secure further funding from investors to build a new high-speed fiber network. She reportedly turned herself in to authorities late last week. 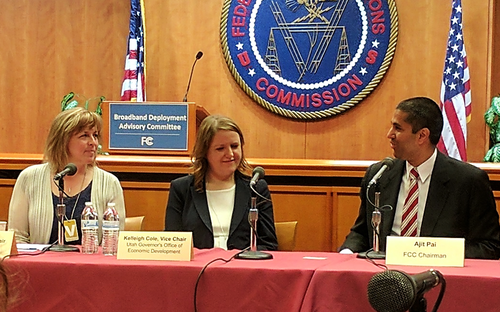 Elizabeth Pierce (left) sits with BDAC Vice Chair Kelleigh Cole from the Utah governor's office and FCC Chairman Ajit Pai. Pierce's role on the FCC's broadband committee may sound like a minor bureaucratic appointment, but Ajit Pai created the BDAC with the ambitious goal of developing model policies for cutting broadband deployment regulations at the federal, state and local levels. And he's already come under fire for his committee member selections. City representatives in general are worried about mandates that could force them to give up leverage in negotiations over telecom equipment installations. While Pai and his allies in the industry want to cut costs and speed up small cell siting -- particularly in support of future 5G wireless services -- critics at the municipal level fear that new policies would prevent them from negotiating for equitable broadband deployments, among other problems. New York's Gamino put it this way in his resignation letter, "I am concerned that the current draft of the [BDAC's municipal] code could lead to municipalities entering into agreements with wireless providers that are counter to the interests of their constituents. Most importantly, we do not believe that the recommendations will help close the digital divide." You're invited to attend Light Reading's Big Communications Event -- the ONE event that delivers fresh perspective on the rapid transformation of the telecom industry and the road ahead. We'll see you May 14-16 in Austin -- communications service providers get in free! The news of Pierce's recent arrest shouldn't have any direct bearing on the BDAC's continued work. Elizabeth Bowles, president and chair of Arkansas-based wireless ISP Aristotle, took over in the role of committee chair following Pierce's departure. However, the picture it paints isn't positive. With Pai's judgment around committee member selection already called into question, the fact that the person he chose to lead the committee is now facing jail time for industry-related fraud doesn't look good. Hope FCC can recover from this bad news, and enhance the broadband industry development. The economy is the most important for the current goverment. In fact, FCC is so famous in Europe and Aisa, it also can't avoid these problems. the broadband business at America looks better than Europe. Will this news influence America broadband deployment? Every new administration brings in a few scoundrels and hacks. But this one seems to have hit the mother lode. Somebody pointed out to me that there's quite a vetting problem in government right now. The funny part of this story is that Ms. Pierce is accused of duping "New York investment companies" with phony contracts. So much for city slickers taking advantage of good old honest country folk.